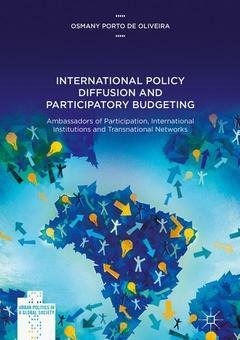 This book explores the international diffusion of Participatory Budgeting (PB), a local policy created in 1989 in Porto Alegre, Brazil, which has now spread worldwide. The book argues that the action of a group of individuals called ?Ambassadors of Participation? was crucial to make PB part of the international agenda. This international dimension has been largely overlooked in the vast literature produced on participatory democracy devices. The book combines public policy analysis and the study of international relations, and makes a broad comparative study of PB, including cases from Latin America, Europe, and Sub-Saharan Africa. The book also presents a new methodology developed to examine PB diffusion, the ?transnational political ethnography?, which combines in-depth interviews, participant observation and document analysis both at the local and transnational level. Part One. Dynamics.- Chapter 1. Accessing international policy diffusion.- Chapter 2. The dynamics of the process of diffusion: Institutions, individuals and mechanisms.- Part Two: The Process.- Chapter 3. Ambassadors of participation: the internationalisation of PB.- Chapter 4. Promoting Transnational Connections: The Networks of Participatory Democracy.- Chapter 5. The Cascade: From the Tipping Point to Mass Diffusion.- Part Three. Effects.- Chapter 6. Mosaics of participation: Participatory Budgeting in Andean America and transfers on a national scale.- Chapter 7. Sowing democratic seeds in the Desert: The Diffusion of PB in Sub-Saharan Africa.- Chapter 8. Conclusions and implications.- Epilogue. The arrival in North America. Osmany Porto de Oliveira is Professor of International Relations at the Federal University of São Paulo (UNIFESP). He holds two PhDs in Political Science, from the University of Sorbonne Nouvelle, France, and the University of São Paulo, Brazil. He received his B.A from the University of Bologna, Italy, and an M.A from the University of Sorbonne Nouvelle/IHEAL, France. His previous book is Le transfert d'un modèle de démocratie participative: Paradiplomatie entre Porto Alegre et Saint-Denis.